If you’re considering lake homes for sale in New York, Cayuga Lake should be a strong contender. Carved out of the land by glaciers thousands of years ago, Cayuga Lake is the longest of the state’s Finger Lakes and is also one of the deepest. The lake is a recreation haven year-round, catering to boaters, hunters, anglers, hikers, and even bird watchers. The surrounding areas are also steeped in culture and creativity, ensuring your Cayuga Lake experience will be engaging an ...Learn more here! If you’re considering lake homes for sale in New York, Cayuga Lake should be a strong contender. Carved out of the land by glaciers thousands of years ago, Cayuga Lake is the longest of the state’s Finger Lakes and is also one of the deepest. The lake is a recreation haven year-round, catering to boaters, hunters, anglers, hikers, and even bird watchers. The surrounding areas are also steeped in culture and creativity, ensuring your Cayuga Lake experience will be engaging and absolutely unforgettable! Cayuga Lake spans almost 40 miles, ultimately joining the Eerie Canal, and reaches a staggering depth of 435 feet at one point. The complex topography of the lake features mudflats to the north that host various species of migratory birds, along with shallow waters to the south that typically freeze in the winter. This type of intricate ecosystem not only attracts avid bird watchers, but it also makes for some darn good fishing! While northern pike, largemouth bass, smallmouth bass, and pickerel are found in the more shallow waters of the lake, trout fishing is all the rage in these parts. Rainbow, lake, and brown trout are particularly prized catches, but you’re also likely to find perch, pike, and bullhead. With so many worthy opponents waiting just below the surface, your hook is bound to snag on something worth bragging about! Cayuga Lake is a popular destination for off-road cyclists, avid hikers, and boating aficionados as well. Mile upon mile of unpaved trail wraps around the lake for you to test your bike gears on, while many of the surrounding hiking trails lead directly to spectacular waterfalls. Numerous public and private marinas dot the shoreline of Cayuga Lake for your convenience: launch your sailboat, jet ski, motorboat, or anything that floats and delight in a new perspective of the lake’s majesty. And to think that lake homes for sale can call all of these striking elements part of their landscaping! With so much to revel in on the lake, it may be tempting to never leave your lake-view property—that is until you realize what lies just off the shoreline. Cayuga Lake is surrounded by several notable golf courses. Some courses, such as King Ferry Golf Club and Seneca Falls Country Club, have breathtaking views of the lake from the course. Rolling hills, deep ponds, and stunning views combine to create a truly original game of golf. If you’d like to live on a Cayuga Lake golf course, visit GolfHomes.com for property listings and details. Cayuga Lake touches Ithaca, New York, at its southern tip. Home to prestigious Cornell University and Ithaca College, the town has a bohemian charm that celebrates the area’s unique heritage and culture. The world-class dining scene is supported by locally sourced produce from eco-friendly farms, and the fine cuisine washes down quite nicely with a glass of Cayuga Lake wine. The lake is literally surrounded by award-winning wineries on all sides. Surround yourself with all Cayuga Lake has to offer today! Cayuga Lake is the longest of New York's eleven Finger Lakes, and is located in the heart of the region. Its blue waters reflect hillsides lush with vineyards and orchards, set among forests of maple, oak and hemlock while waterfalls pour in splendid gorges. Charming lakeside villages and towns inspire the relaxation found in a gentler place. Reachable by all major state highways, the area is in central New York, approximately one hour from Syracuse and three hours from Albany and Buffalo. Spanning from the Montezuma Wildlife Refuge in Cayuga and Seneca Counties to the City of Ithaca in Tompkins County, Cayuga Lake stretches for 38.2 miles. This lake has 95.3 miles of shoreline, 66 square miles of surface area, and a depth of 435 feet. Among other attributes, Cayuga Lake is acclaimed for being part of the original Erie Canal (Cayuga-Seneca Canal), and for being a designated Important Bird Area for waterfowl migrating along the Atlantic Flyway. Each year, thousands of Canadian Geese, Ducks, Loons and other birds enjoy the lake's waters as a rest stop on their way to warmer weather for the winter. The New York State Route 90 Scenic Byway stretches along the lake's eastern shore from Montezuma to Genoa, before turning eastward to its terminus in Homer. In addition to the Cayuga Inlet at Ithaca, five tributaries at the southern end feed the lake. These are Cascadilla Creek, Fall Creek, Salmon Creek, Six-Mile Creek and Taughannock Creek. Cayuga Lake outlets into the Seneca and Cayuga Canal, which joins the northern ends of Seneca and Cayuga Lakes. This canal connects with the Erie Canal north of Seneca Falls. Lake Ontario can be accessed from Cayuga Lake via the Erie Canal, Cross Lake and the Oswego Canal. Because of its low elevation, 384 feet above sea level, the lake has many marshes, particularly at the northern end, which extends into the Montezuma National Wildlife Refuge north of Seneca Falls. It was known as Gweh-u-gweh, "the lake at the mucky land", by the Cayuga Nation and "lake of the marshes" by the Mohawks. Depth of Lake: 435 ft. In the shallow water near the Cayuga Lake State Park, largemouth bass, bullheads and carp thrive. In deeper water, anglers can catch northern pike, small mouth bass, lake trout, landlocked salmon and many other varieties of fish. Cayuga County offers four public access points onto Cayuga Lake along the eastern shore: the State Department of Environmental Conservation's launch at Mud Lock in the Town of Aurelius, entering the Cayuga-Seneca Canal; the Village of Cayuga's newly built floating dock station at Harris Park; the Village of Union Springs' launch at Frontenac Park, and the State's launch at Long Point State Park in the Town of Ledyard. 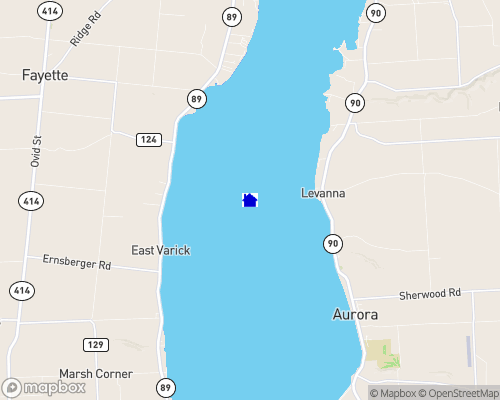 Cayuga Lake State Park 2678 Lower Lake Road, Seneca Falls, NY 13148, Phone: (315) 568-5163 Cayuga Lake State Park's terrain is flat at lakeshore, where the beach and sun lawns are, then slopes gently uphill to campsites and cabins. The scenic highlight of the park is its expansive view of Cayuga Lake. The park has a boat launch, playground, playing field and recreation building. Directions: Rte 89, north end of Cayuga Lake, West Shore. Seasons/Hours: Camping season begins the last weekend in April and it ends the last weekend in October. The park is open all winter. Cayuga Lake Region Cities ITHACA--Located at the southern tip of Cayuga Lake, Ithaca is home to Cornell University as well as Ithaca College. Its star attractions are as numerous as they are diverse, ranging from wineries and recreation to museums and performing arts. The city is perhaps best defined, though, by its breathtaking gorges and waterfalls throughout the area. At 150 feet high and 175 feet wide, Ithaca Falls is undoubtedly the most impressive--right in the town's center. SENECA FALLS--"The Birthplace of Women's Rights," Seneca Falls is home to the National Women's Hall of Fame as well as the Women's Rights National Historic Park. Located at the northern tip of Cayuga Lake, Seneca Falls attributes much of its liberal past to its history as a heavy abolitionist area. In fact, it was considered America's frontier before the bravest pioneers forged their way over the mountains. AUBURN--Located northeast of Cayuga Lake, Auburn is a city rich in history. Not only was it the home of William Henry Seward, who served as Secretary of State under Abraham Lincoln (and who negotiated the purchase of Alaska, known as "Seward's Folly"). As the birthplace of the "talkie," it also changed the way we view movies today. AURORA--Founded in the late 1780s, Aurora has been known as an educational center since the 1790s when its first school was built, In addition, Wells College was founded in 1868 by Henry Wells, pioneer of the Wells Fargo Stagecoach and American Express. Historic buildings are abundant in this small gem on Cayuga Lake's eastern shore. In fact, most of Aurora--including the Wells College campus--is listed in the National Register of Historic Places.